Traders have been covering shorts for the last two days on expectations Greece will vote to pass the required austerity measures needed to obtain the next $17 billion in funds to hold off a default in July. The Greek situation is very fluid with reporters claiming 151 votes for the required austerity and that is exactly the number needed with no room to spare. Four votes in the prime ministers party have already defected to the other side making it 151 for and 149 against austerity. I don't know what happens in the case of a tie but obviously this is going to be VERY close. Last week the markets were pricing in a credit event or a default of some kind but that appears for the moment to be off the table. The final vote is not expected until Wednesday and there is another vote on the implementation of the austerity plan on Thursday. If both votes pass the pressure would ease on Greece at least for the time being. Their potential default on July 11th would go away. However, this is just one more chapter in the saga. Once past this hurdle the EU/ECB/IMF will begin discussing the next $140 billion bailout needed for 60 days from now. That one is "supposed" to be the final package that will get Greece through the next five years until their austerity plan reduces expenses and comes closer to balancing the budget. I am not holding my breath. However, French banks offered to roll over their Greek debt and extend it for 30-years. If other foreign banks sign onto the same program the pressure will begin to ease. That is called kicking the can well down the road. It would be a long time before the potential sovereign debt default would come back to haunt us. This also allows those banks to write down that potentially uncollectible debt at a pace that will not be severely cripple their capital accounts. The Greek economy is only $300 billion while the entire Eurozone is $16 trillion. This is a very minor piece of the Eurozone puzzle but it is viewed as the first of several problems that could eventually include Spain with a GDP of $1.46 trillion. Greece was the first domino to fall with Ireland, Italy, Portugal and Spain still in the early stages of the same problem. Traders covered their shorts either voluntarily or involuntarily as a result of the market spike. It was not because the U.S. economics suddenly improved because they didn't improve. The Consumer Confidence for June dropped another three points to 58.5 and the lowest level since November. This was a decline from the May reading of 61.7. The cycle high was 72.0 in February. The biggest decline came in the expectations component, which declined from 76.7 to 72.4. The present conditions component only fell -2 points to 37.6. Buying plans declined significantly with those planning on buying autos falling from 13.7% to 10.7% and homes from 5.5% to 3.7%. 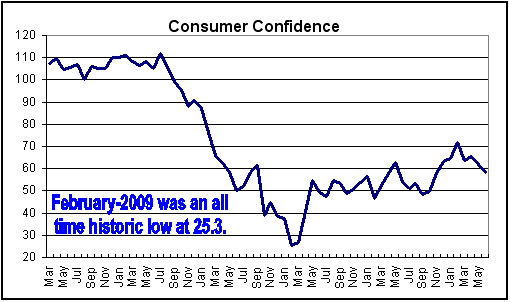 The decline in confidence was mostly from the older and higher-income consumers. Worry over the economy as they head into retirement is a major problem. Analysts said confidence was actually a lot lower earlier in the month but improved significantly as the month progressed and gasoline prices declined. Falling home prices, higher gasoline, falling job numbers and all the problems overseas with the debt crisis and Arab spring are still weighing on confidence. 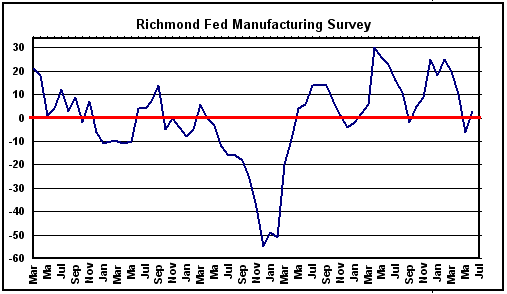 There was a bit of positive news in the Richmond Fed Manufacturing Survey, which rose to +3.0 in June from a -6.0 in May. That is a significant +9 point gain and a return to expansion territory. This is well below the 25.0 cycle high back in February. New orders returned to positive territory at +1.0 from a sharp decline to -15.0 in May. Backorders improved slightly at -16.0 from -19.0 but just barely. However, both employment components declined. The average workweek fell into negative territory at -5.0 from a high of +20 back in January. The decline has been a steady 3-5 points a month. Even though the actual employment component declined from 14.0 to 12.0 it remained in double-digit expansion territory for the eighth consecutive month and that is the longest streak since the report's inception. In theory this suggests manufacturers are continuing to hire at a decent pace. The Richmond Survey was a definite improvement over the sharp decline in the Texas Manufacturing Survey to -17.5 in June from -7.4 in May. Those numbers were released on Monday. The weekly Chain Store Sales came in much higher than expected with a +2.9% gain after a -0.7% decline in the prior week. There is a lot of noise in these numbers but every little bit of positive news helps. The Case Shiller Home Price Index for April declined -4.0% compared to the prior reading of -3.6%. This is not a market mover. Everyone knows home prices are lower compared to last year so this is just confirmation of the continued decline. The calendar for the rest of the week will be dominated by the Greek vote, which has been delayed until Wednesday. That could be a market mover if it does not go as planned. 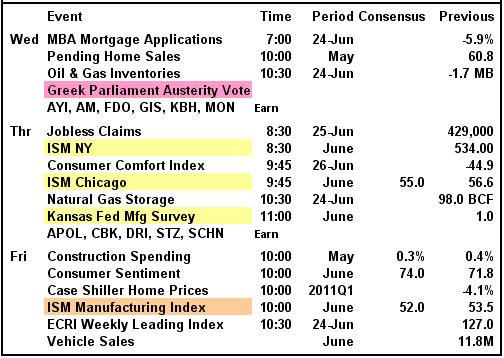 Back at home we have the three regional ISM and manufacturing reports on Thursday and then the national ISM on Friday as the second biggest event for this week. 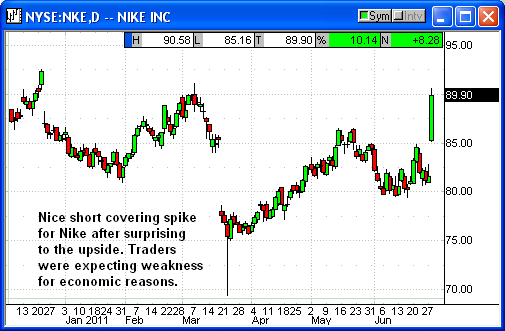 In stock news Nike (NKE) soared +8.28 after reporting better than expected numbers on Monday night. Nike said sales in the U.S. rose by +15% in a weak economy. This was very unexpected given the price Nike gets for its shoes. The company raised revenue estimates for 2015 to $28-$30 billion compared to prior estimates of $27 billion. They reaffirmed their goal of $12 billion in cumulative free cash flow from 2011 through 2015. Earnings released on Monday night were $1.24 per share compared to estimates of $1.16. Microsoft (MSFT) spiked into the clouds after announcing their 22-year old Office product was going to be offered as a cloud product. 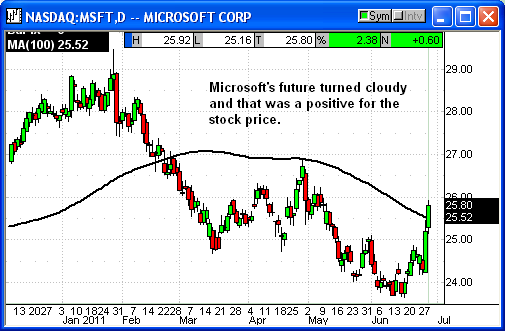 Microsoft was one of the major reasons the Dow and Nasdaq had two really good days. Microsoft's Outlook, Excel, Sharepoint, etc will now be available as a cloud application with prices based on usage. Basic Outlook email will cost $2 a month and a standard business package for $6. Advanced offerings could cost up to $27 per month. Google charges a flat $50 per user per year for its Web-based Google Apps product with email, calendars, word processing and other applications. Microsoft will host the applications and the user data on monster server farms in multiple data centers. The move puts Microsoft into direct competition with Google but in this case Microsoft has a head start even though they are late to the cloud party. Google has 40 million users of the Google Apps suite. Comscore estimates Microsoft has 750 million Office users worldwide so a very fertile environment for moving existing customers to the cloud and creating a new monthly revenue source. 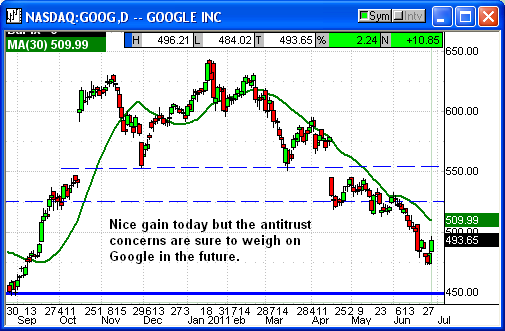 Google (GOOG) rallied +$11 after announcing a new feature called Google+ that is a direct attack on Facebook. Basically Google+ allows you to put your friends and contacts into different groups on their Facebook like product. By grouping contacts you can allow each group access to different parts of your profile. For instance the pictures of your children may only be visible to people in the family group. Business contacts would not see your family posts, etc. Facebook actually has these features but they are troublesome to implement. Google is trying to chip away at the 750 million Facebook users. 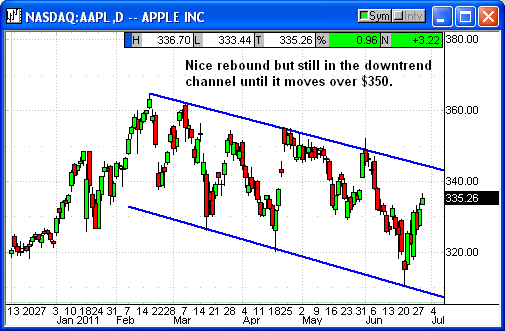 Apple has finally strung a week of gains together to close at $335 after hitting a low of $310 last week. The downtrend is still not broken but Apple has been getting some good press and Google has been getting bad press. If you have money to throw at a big tech into quarter end that meant Apple was the preferred vehicle. Analysts are starting to upgrade iPad estimates again and we are getting closer to iPhone 5 so it appears the buyers have finally found a level they were comfortable with. The anticipation of a positive vote in Greece and avoidance of a sovereign debt default pushed the euro higher and the dollar lower and that was positive for oil prices and precious metals. Gold eased back over $1500 but not by much. The lack of a debt default would be negative for short-term gold prices. Crude oil prices would be helped by a resolution to the crisis and a return to business as usual in Europe. Maybe not in Greece but the rest of Europe might calm down and return to slow growth if the crisis is resolved. U.S. WTI crude rallied more than $2 after testing support at $90 for three consecutive days. In overnight trading it is up to $93.11 and rising. 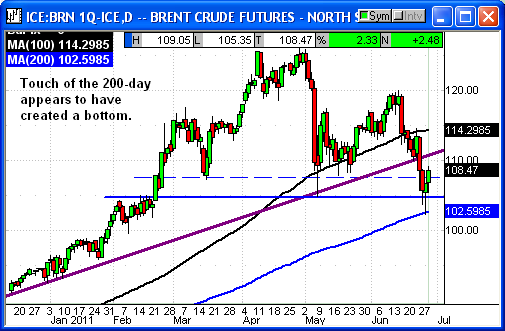 Brent rallied to $108.85 from its low at $102 on Monday. In after hours trading it has broken $109. There is no surprise here. The IEA news produced a knee jerk reaction and that news has passed. The fact the IEA felt they had to release oil for only the third time in history is confirmation enough that there are serious supply problems on the horizon. Ignore these facts at your own risk. The S&P rallied +16 points today and stretched its two gain to +33 points with a close at 1296. That is just a point over critical resistance at 1295 so in reality it stopped at resistance. With the Greek vote scheduled at 5:AM ET on Wednesday this would be the perfect plate for a sell the news event. The vote has already been priced in after the big gains for the last two days. 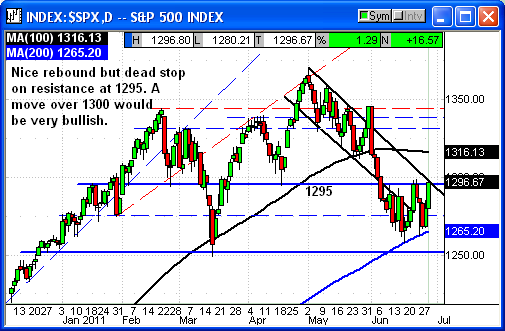 Until the S&P moves convincingly over 1300 we should remain cautious. I was expecting an end of quarter window dressing event this week and the short squeeze from Friday's oversold conditions help to accelerate the buying so far this week. Ideally we would have a minor sell the news event on Wednesday after a positive vote and then have traders buy that dip for a final end of quarter move higher. Historically that June close carries over into the first week of July and then the selling returns. I wrote last weekend there were some worries brewing about how strong Q2 earnings would be given the consumer dip in May. The Nike earnings and revenue increase in Q2 suggests there may not have been as much of a spending strike as previously expected. I read to articles this week suggesting earnings would still be strong and possibly in the +18% range. If that is the case any dip in early July could be brief. If we were to see any further improvement in the economics we might skip a July dip. There are lots of variables still in play so it is too hard to predict that today. However, analysts almost unanimously expect a year-end rally as economics begin to accelerate later in the year. That acceleration obviously remains to be seen. 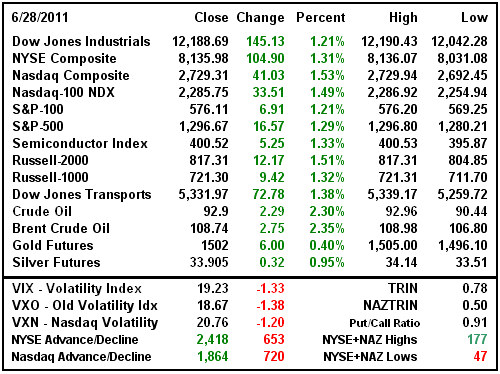 The key for Wednesday is the Greek vote in the morning and the S&P resistance at 1295 and 1300. A move over 1300 could generate some additional short covering. The Dow stopped just short of resistance at 12,200 but had a decent two-day rebound on short covering and the gains in Microsoft, IBM, Exxon, Chevron and Caterpillar. Dow 12,200 is a key resistance level and the dead stop ahead of the vote makes this a perfect spot for a sell the news event. It also sets up a perfect spot to really squeeze the shorts if some better than expected news should appear. If the Plunge Protection Team (PPT) is paying attention they could break the market out of its recent range with a very small application of funds. 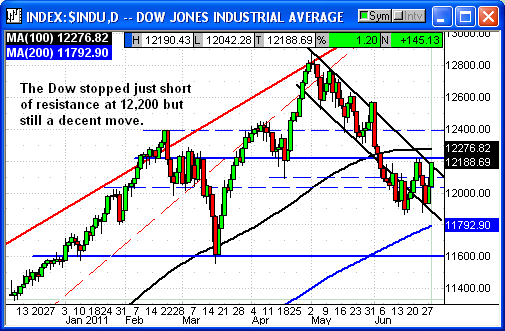 The Dow and S&P both had a double test of their support and they could be primed to move higher. The oversold conditions have not been completely eliminated and I am sure there were plenty of shorts setting up at the resistance close for that sell the news event. 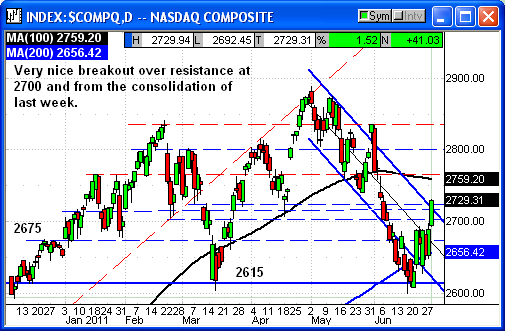 The Nasdaq broke out of its resistance at 2700 that correlated to the S&P at 1300 and Dow at 12,200. The Nasdaq 2700 level was broken solidly with a +41 point gain to 2729. That close cleared congestive resistance and was a clear breakout of the consolidation pattern from last week. The next higher resistance will be the 100-day average at 2760, which is also the resistance high from January. I like the gains in the big techs and the positive trends over the last several days. This is more than likely part of the end of quarter window dressing along with a bit of short covering. Time will tell. The Russell is looking really strong with a solid move above last week's consolidation pattern. 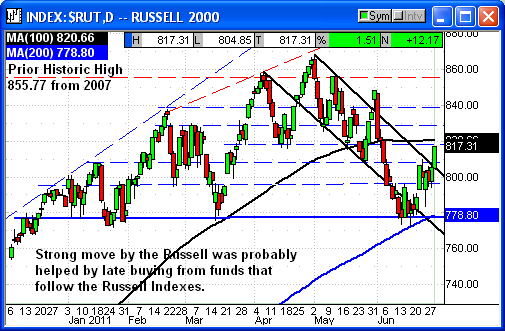 However, some of the gains this week are undoubtedly from funds catching up with the Russell reconstitution on Friday. As funds bring their portfolios back into alignment with the Russell indexes it requires buying of the new stocks added to the index on Friday and that pushes the index higher. The Russell broke out of its downtrend channel and now has resistance at 820. If this move continues it would be very bullish regardless of the reason. The Russell should also benefit from end of quarter window dressing. Wednesday is going to be critical for the rest of the week. The Greek vote is scheduled at noon Greek time, 5:AM ET. Greek citizens are planning on surrounding Parliament on Wednesday morning to prevent members from getting to the Parliament meeting to vote. Police have been fighting demonstrators all day and the crowds on Wednesday are expected to be very large. The potential for violence is huge. How that will impact the vote, if at all, is unknown. With only one vote separating the two sides anything is possible. However, Greek leaders know they have no choice. If they do not approve it there will be no money and Greek will default on payments within two weeks. They can't borrow from the market and the ECB/IMF said they would not provide any loans in the future if Greece does not pass the austerity measures and ends up in default. They have given Greece an ultimatum and the citizens in the streets don't really understand the consequences. I do expect a sell the news event but hopefully it will be light. The vote priced in but end of quarter window dressing ahead of the holiday weekend should still be active. I would buy a dip for a trade but barring unforeseen events I still expect further weakness by the end of next week. Our Independence Day special is in full swing. Readers can subscribe for the next week at the cheapest prices of the year using our July 4th package special. This is a significant discount over the monthly prices and we are offering a choice of free instructional videos to those that take advantage of this special. The stock market has put together a very strong two-day bounce. I am concerned it's just window dressing but whatever it is the short-term trend is now up. Technology stocks are getting most of the love these days. You could pretty much throw a dart at a board of NASDAQ-100 components and come up with something that looks poised to rally, although there are plenty you probably don't want to chase after. EL - has rallied to resistance and a breakout to new highs could be an entry point. DVA - is on the verge of breaking out past resistance near $86.00. ILMN - is about to test its all-time highs set last month near $76.80. IBM - the rally has been impressive and IBM is back above its 50-dma. Personally I'd rather look for a dip near $168 before considering new positions. CAT - is looking a little short-term extended here but a breakout past resistance near $105.00 would be very bullish. MCD - has powered past resistance near $83.00 and rallied to new highs. A dip back toward $83 might be an entry point. NSC - shares are still stuck in a sideways trading range but the long-term trend is still up and NSC looks like it's coiling for a breakout higher. CERN looks like a strong bullish candidate. The stock never broke its long-term up trend and after three weeks of consolidating sideways it is now pushing through resistance near the $60.00 level. 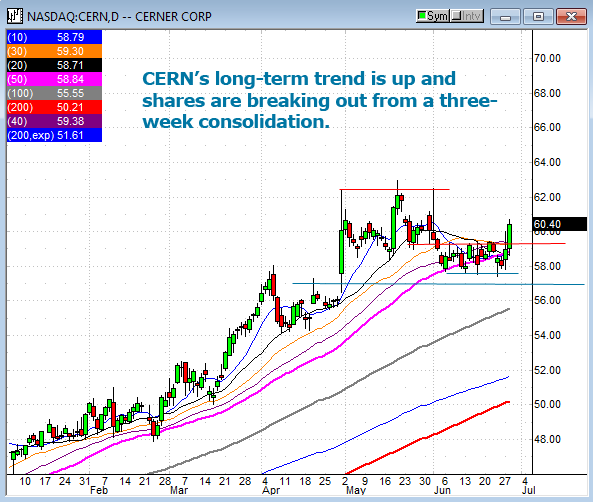 CERN also has clear support near $57.50. Plus, short-term technical indicators are turning bullish again. I don't necessarily trust the market rally this week. It smells like end of quarter window dressing. Plus, the market could easily reverse if the critical parliament vote in Greece doesn't pass. Of course there is always the chance that investors decide to "sell the news" even if the Greek vote does pass. Therefore we want to keep our bullish positions in CERN small to limit our risk. I am suggesting small bullish positions now with a stop at $57.40. There is some resistance in the $62.50 area but I'm setting our target at $64.75. We do not want to hold over the late July earnings report. Keep in mind that July options expire in less than three weeks. The end of quarter window dressing continues as stocks rally toward the end of the month. GS bucked the trend and hit our trigger to buy puts. Meanwhile oil service stocks were some of the stronger performers today and SLB is on the verge of hitting our stop loss. 06/28 update: The end of June window dressing continues and ANF rallied +2.6%. Shares opened at $65.48 and surged higher but the rally started to lose steam. Volume was light as well. This remains a short-term, aggressive trade. Our first target is $69.50. I'm adding a secondary target at $71.50 but ANF would have to rally past resistance at $70.00 and the 50-dma to get there. 06/28 update: Hmm... I am starting to think we have missed the entry point in TDC. Shares soared another +2.8% and rallied toward resistance at $60.00. I don't want to chase it here but the stock could definitely keep going as fund managers look for winners to dress up their portfolio. At the moment we have a buy-the-dip entry point to buy calls at $56.50. FYI: TDC's P&F chart has produced a new triple-top breakout buy signal with a $79 target. 06/28 update: TIF opened higher at $76.80 and rallied to a +2.0% gain. Shares are above recent resistance at $77.00 and set a new all-time closing high. Our targets are $79.75 for the July calls and $79.75 and $84.00 for the August calls. 06/28 update: BDX is bouncing back toward the top of its trading range. The stock should have resistance near $87.00 but if the market continues to rally at its current pace BDX could breakout. I am not suggesting new bearish positions at this time. 06/22 The bid for our option has vanished. I am removing our stop loss on this trade. 06/28 update: Oil service stocks were big performers today but DO continues to lag behind its peers. Shares spiked to $69.34 intraday and settled with a +0.9% gain versus a +3.7% gain for the OSX index. The $70.00 level should be resistance for DO but I'm not suggesting new bearish positions at this time. Our targets are $64.50 and $62.50. FYI: Traders should note that the most recent data listed short interest at more than 14% of the float. That does raise the risk of a short squeeze should the stock suddenly find strength. 06/28 update: Goldman Sachs continues to underperform the market and underperform the financials. The stock broke down under support at $130.00 and traded to $128.30 intraday. Our trigger to buy puts was hit at $129.00 and I would still consider new put positions now. 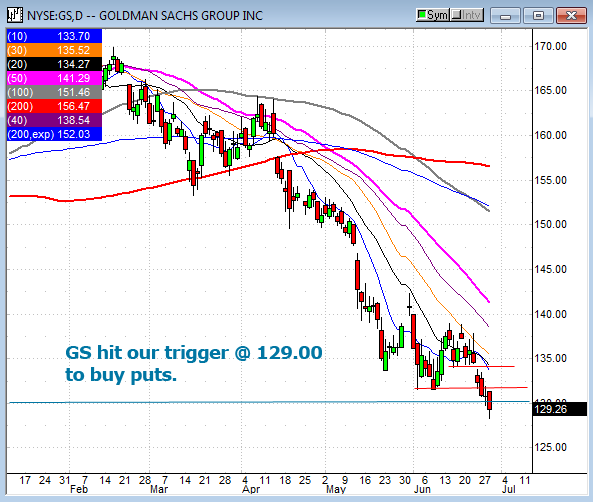 GS should have short-term overhead resistance at $130, $132 and $134. We have a stop loss at $135.25. I do consider this an aggressive trade. GS can be a very volatile stock at times. If triggered our targets are $121.00 and $116.00. We do not want to hold over the mid July earnings report. FYI: The Point & Figure chart for GS is bearish with a $102 target. 06/28 update: The stock market's widespread gains continues to fuel a bounce in PSA. Shares are now testing overhead resistance near $112.00 and its 100-dma. Technically this could be another entry point to buy puts but readers might want to wait for a reversal first. 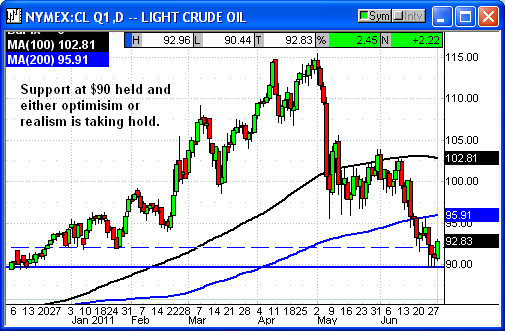 06/28 update: I have been warning readers to expect an oversold bounce in RIG. Shares could easily rebound back toward the $64-65 area. More conservative traders may want to exit early. I am not suggesting new positions at this time. We wanted to keep our position size small to limit our risk. 06/28 update: We are getting whipsawed in SLB. I warned readers that yesterday's intraday breakdown and reversal higher looked like a bear trap. Today shares rocketed higher with a +4.6% surge toward resistance at its 50-dma. The high today was $84.61. Our stop loss is at $84.65. Odds are really good we're going to get stopped out tomorrow. Since the damage is already done we might as well hang on and see if shares actually hit our stop or will they see some profit taking tomorrow. I am not suggesting new positions at this time. FYI: Volume was well above average today in spite of the market's low volume. 06/28 update: The bounce in SNDK continues but shares couldn't get past the $40.80 level. I am still expecting overhead resistance in the $41-42 area. I would not launch new positions here. 06/28 update: There is no change from my prior comments on TROW. We're currently waiting for a breakdown under $56.00 with a trigger to launch positions at $55.75. We will keep an eye on overhead resistance at $60.00 and its 50 and 200-dma. A failed rally near this area might be an alternative entry point.